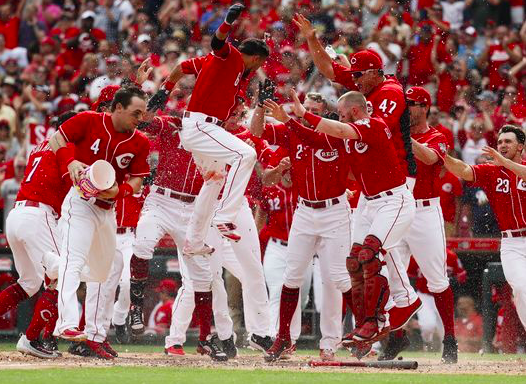 The Cincinnati Reds have finished last in the NL Central in four consecutive seasons. Not since 2013 has the club had a winning record. However, they have a new manager in David Bell and made some moves over the winter that indicate they want to turn things around quickly. Can Cincinnati become a surprise team in 2019 and challenge for a playoff spot or will they be doomed to yet another last place finish? The Reds have made serious changes to a rotation that had the second-highest ERA in the National League last season. Through a series of trades, the club acquired Sonny Gray, Alex Wood, and Tanner Roark, three proven starters. Gray struggled with the Yankees last year, but he’s only 29, and should be capable of returning to the ace he was in Oakland a few years ago. Wood is another pitcher on the right side of 30 who has looked like a frontline starter with the Dodgers the last two seasons. Roark is a little older, but he should at least be a dependable back-end starter who’s thrown at least 180 innings in three straight seasons. Those three additions should bring some much needed-stability to Cincinnati’s rotation. Meanwhile, the club hopes to have a homegrown ace in Luis Castillo, who got the opening day start after going 10-12 with a 4.30 ERA in 31 starts last season. At age 26, the Reds are expecting Castillo to take a big step forward this year. The Reds are also hoping to get a little more out of Anthony DeSclafani, who made 21 starts last season after missing the entire 2017 campaign. When healthy, DeSclafani is at least a solid mid-rotation starter. If those five starters can stay healthy, the Reds should have a rotation that’s at least middle of the pack in the National League, possibly better. But if that isn’t the case, the Reds will have to go back to the youngsters who struggled to establish themselves the last couple of seasons. The likes of Tyler Mahle, Sal Romano, and Cody Reed all have potential, but they were all pushed to the big leagues too quickly. The Reds would love to see all of them have a little more time to develop before being forced back into a big league rotation. Surprisingly, the Reds had a decent bullpen last season. They will also have many of the same faces back in 2019. Raisel Iglesias is entrenched as the closer after posting an ERA under 3.00 in three straight seasons. Veteran David Hernandez will anchor the contingent of setup men after an impressive 2018 campaign. Fellow veteran Jared Hughes is also back after he registered an impressive 1.94 ERA last year. The Reds also brought in Zach Duke this offseason to give them a proven lefty to use late in games. Beyond those four established pitchers, the Reds will look to their youngsters to help make their bullpen better than average. Lefty Amir Garrett took a step forward last year, but the Reds think he’s better than the 4.29 ERA he posted in 2018. Cincy also has high hopes for the likes of Michael Lorenzen, Wandy Peralta, and Matt Wisler. All three have had some level of success in the majors, and pitchers like them will determine just how good Cincinnati’s bullpen will be in 2019. The Reds brought in some much-needed offensive reinforcements over the winter. Joey Votto saw a slight dip in their numbers in his numbers last year, and now that he’s 35, he’ll need a lot more help. Yasiel Puig was the big addition. Obviously, he’s had his ups and downs, but with free agency coming for him next winter, he could be poised for a big year now that he’s had a change of scenery. The aging Matt Kemp is also an important addition, as he could provide a little power boost with Votto on the decline. In addition to that trio of veterans, the Reds have a game-changer in Eugenio Suarez. After hitting 34 home runs and posting an OPS of .892 last season, Suarez may be Cincinnati’s most important offensive player. Cincy also has Scooter Gennett to help out the middle of their order after his sudden power surge the last few seasons. The same can be said of Scott Schebler, who hit 30 home runs in 2017 before being held back by a shoulder injury last season. Of course, it could boil down to the team’s young players. Jose Peraza took a big step forward last year, and the Reds need him to continue to be a spark plug for them. Youngsters Jesse Winker and Phillip Ervin also showed plenty of promise in Cincinnati’s outfield in 2018, and they could both bring a lot to the table if they can continue to progress in their development. The Reds should get credit for making an honest effort to improve their team during the offseason. However, even if all of their moves pan out, it’s still hard to see them keeping pace with the Cubs and Brewers in the NL Central. In the end, the best the Reds can hope for is to be an average team. Look for Cincinnati to finish 75-87, which for them is actually a big step in the right direction.